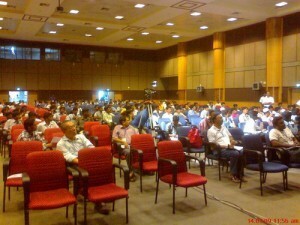 This post is to share my experience at the Open Source India Tech Days ‘09, actually i was there for the last two days but missed the first day ( not being able to bunk my internal assesment tests) I really enjoyed my time there at the Chennai Trade Center Hall. I attended the second and third day of this big event, so i will tell you about what happened there on those two days. He was telling us about the Mobile Technologies and its future. He enlightened us with some knowledge about the Moblin (mobile tech from Intel) he also explained about the importance for opensource in todays Business. Well i did enjoyed his speech. The next speaker on that day was Mr. Rakshat Hooja, IDA Systems who actually introduced us with the openmokku, an opensource mobile platform based on GNU/Linux. Then Mr. Thilak Kumar of Wind River, (google’s android specialist) talked about the opensource mobile platforms and their importance in todays world. He also added some informations about the latest Handsets. 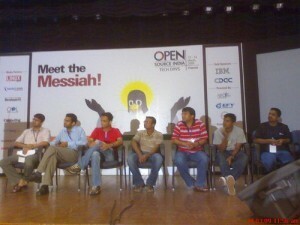 And they had a nice pannel discussion expressing their overall thoughts about the opensource technologies. He was talking about his “Falling in love with FOSS, he shared all his experiences telling us how he made his hands dirty playing around Linux and the so called “Open Source Softwares”. The next speaker was Mr. Gautam Sinha, CTO Times Business Solution Limited. He shared a lot of his company experience using FOSS ( well not about his commercial facts) He told about why the Open Source is Consumed by the IT Management.. There was a lot of people asking questions to him about the in and arounds of the IT industries and Mr. Sinha provided a better solution to all of them. Then Mr.Bharathi of the Chennai LUG gave an interesting speech figuring out the importance of the LUG’s in India, and what are the roles played by the lug’s to help out linux newbies. He also told about the mailing list, and how people communicate inside the community via the mailing list. Then Mr. Ashok of TCS was talking about Where and why Foss is used.. He also gave ideas for the students on how to decide before starting your career with foss. Thats how the OSI Tech Days came to end. We must actually thank LFY for making up such a essential fest at the right time. If you also attended the OSI Tech Days programme or want to share something on it. Please feel free to post your comment below. 10 comments - really? way cool! This post is best of urs. Nice writing man . Hey Magesh ! Good Post , Really love it ….